One of the world's fastest lenses; made in Holland! See below for more info. A lens is a piece of glass or synthetic material used to catch transmitted light on a film or sensor plane. One or more lenses are used in a construction, known as objective. Not all sorts of glass can be used for telescopes, microscopes, binoculars or photographic equipment. Since Nikon Corporation started in 1917 as a merger of - among others the glassworks of Fujii Bros.- it is able to melt its own glass. Today Nikon may choose out of nearly 300 ´recipes´ to form the sort or type of glass, needed to produce a specific lens. Nikon Corporation sent off an application for the trademark ´Nikkor´ in 1931, which was approved in April 1932. Since then all photographic lenses are called Nikkor. Some of them with a prefix or with a suffix, indicating the (special) purpose of the lens or one or more of its characteristics. The very first lenses - for Nikon rangefinder cameras - were engraved with the (former) company´s name ´Nippon Kogaku Tokyo´ or ´Nippon Kogaku Japan´. During the American occupation of Japan - just after W.W.II - all lenses had an additional engraving: ´made in occupied japan´ and those that were sold in military shops were ´EP´ engraved. Early RF lenses made for Contax cameras have a ´C´ engraved on the side of the lens barrel. The ´C´ on the lens ring of all lenses indicates ´coating´. Prefixes like W (Wide), AF (auto focus), R-UW (Underwater), Fisheye, Bellows, UV-Micro, Zoom, VR (vibration reduction) are a few of them. A very rare prefix can be found on the View-Nikkor mounted on an Airesflex Twin Reflex Camera and the Pro-Nikkor mounted on Nikkormat/Nikomat slide projectors. Suffixes after the name ´Nikkor´ are indicating the number of elements in the lens. These suffixes were used up to the early 1970´s. U = (Uns) for 1 element, B = (Bini) for 2 elements, T = (Tres) for 3 elements; Q = (Quattor) for 4 elements; P = (Pente) for 5 elements; H = (Hex) for 6 elements; S = (Septem) for 7 elements; O = (Octo) for 8 elements; N = (Novem) for 9 elements and D = (Decem) for 10 elements. Nearly all lenses had in their name ring ´auto´ engraved, referring to the automatic diaphragm. For collectors there are 4 very interesting MF-lenses made for the very first Nikon F SLR camera. These so called 'tick mark' lenses have at the distance and aperture ring some marks, which you will not find on any later model. The four tick marked lenses are the Nikkor 2.8/3.5 cm, 2/5 cm (see above), 2.5/10.5 cm and 3.5/13.5 cm. They are much sought after and thus relatively expensive. Most modern lenses have - on the side of the lens barrel - an engraving telling us the country it is made in: made in japan - lens made in japan - made in thailand, etc. Some lenses sold in the United States of America have ´US´ engraved preceding its serial number. From left: older lenses have No. preceding its number, later lenses just a number; for the US market lenses have US preceding its number! Nikon Corporation has given nearly all its products a serial number. Among collectors this numbering has become famous for its enigmatic system. If one think that there is a logic in this system, just forget it! Most lenses are numbered with a 6-digit number, sometimes reflecting or referring to its technical specification. Mis-numberings and/or mis-engravings do exist but are very rare. It is a pity that modern lenses aren´t engraved anymore, but have a simple sticker with a number on it. Those stickers can be removed or changed. Serious collectors have to be careful with collecting numbers as many name rings can be changed. Most name rings are locked by a tiny set screw on the side of the ring or lens barrel. If that screw is damaged by a screwdriver it might have been exchanged. All Nikon lenses, used in photographic lenses or binoculars are coated to reduce internal reflections and to improve light transmission. The British Lord Rayleigh (John William Strutt, 1842-1919) discovered in 1886 by accident a coating. A non-coated photographic lens will reflect 4 - 7 % of all entering light, a single coated lens can reflect 2 % and a multi coated lens less than 0.5 %. A non-coated photographic lens with e.g. 6 elements in 5 groups has 10 glass-to-air surfaces and will loose up to 41 % because of internal reflection! In the early years of photography it was therefore impossible to produce lenses of more than 4 or 5 elements as internal reflection ruined any image. The Ukrainian scientist Alexander Smakula (1900-1983), working for the German lens maker Carl Zeiss, invented in 1935 an anti-reflecting coating and a method of lens coating (vacuum-vapoured) that was adopted and used by Nikon in the late 1930´s. After W.W. II most lens makers made use of multiple coatings (up to 8 layers) on all glass-to-air surfaces, reducing reflection to 2 %, which - nowadays - is still unacceptable. Until 1946 cryolite was used by Nikon, later magnesium fluorite and other materials were used. Nikon improved its coatings in 1967. The first lenses benefited from that modern multiple layer coating were the Nikkor-S 1.2/55mm. and Nikkor 1.4/35mm. Later coatings (Nikon Integrated Coating, Super Integrated Coating and Nano-cristal Coating) have made Nikkor lenses famous in the world of photography. The world´s largest optical glass maker Hoya (Japan) and the German lens maker Schneider once tested several old and new lenses. The fast and famous Nikkor-N 1.1 / 5 cm. for the Nikon rangefinder cameras has 12 air-to-glass surfaces which - together - are reflecting an amount of light resulting in an effective aperture - at full opening - of f/1.24. It´s obvious that this lens would perform even better if coated using the latest technology. Light in fact is an electro-magnetic wave of a certain wavelength with a speed of approx. 300,000 kilometer per second! Human eyes can detect light with a wavelength of 400 - 760 nm. (nanometer). Colors like indigo start at 400 nm, followed by blue at 505 nm., green at 560 nm., etc. up to deep red at 760 nm. At a shorter wavelength as 400 nm ultraviolet A, B and C and, even shorter, various X-rays can be detected (but not by human eye). Above 760 nm. infrared can be found. Detecting a color is a matter of reflection and absorption. Is white light reflected by an item we will see that item as being black. An item reflects the color we see and absorbs all other colors. So if light travels through a lens or a binocular, so called interference-reflection will occur, resulting in loss in light. If that lens is coated, absorbing reflection, the light transmission will not decrease. 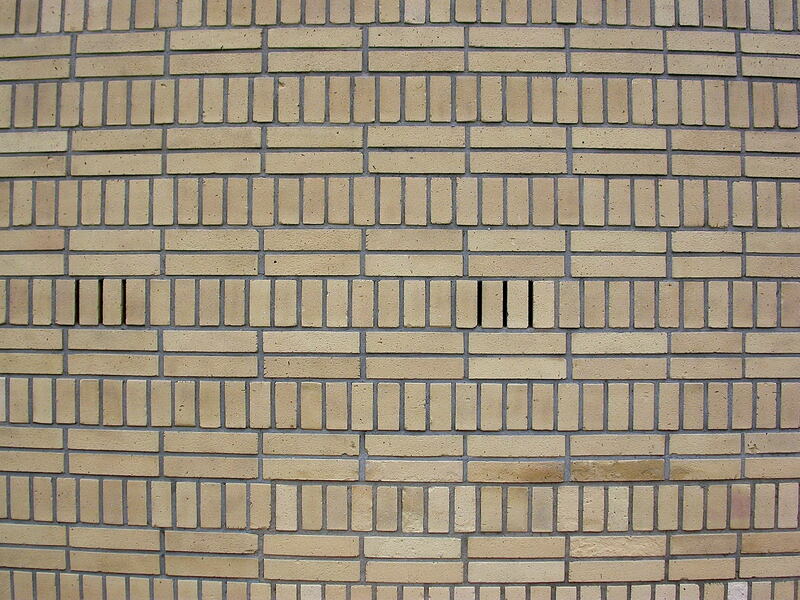 Research has shown that if a coating is 1/4 of the thickness of the wavelength of a particular color and if the breaking index of the coating substance equals the root of the breaking index of the glass in use, maximum absorption of that color will be the result; the so called 'quarter-wave layer'. If we take e.g. the color green at 560 nm. the coating should be 140 nm. thick. The more coatings will be used the better light transmission will be gained. Nowadays reflections of 0.3 % or less are normal. From the very first lens, made for the Nikon single lens reflex cameras, Nikon fitted nearly all lenses with a fork (aka prong) to couple the aperture mechanism in the lens with the exposure meter in the camera (or Photomic view finder). The first version of the fork has a triangular shape. To improve mounting a lens to the camera body the second version has a rounded top. 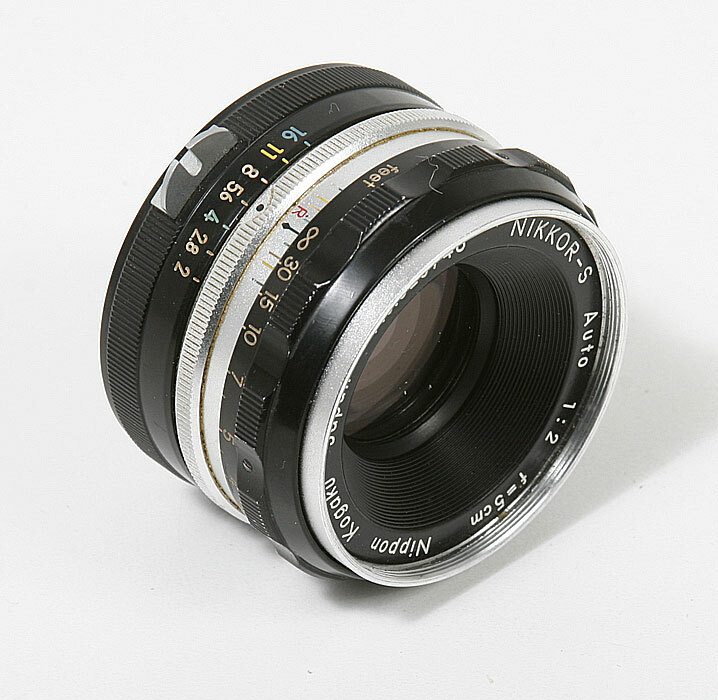 After the introduction of the Automatic Indexing (AI) system in 1977 all Nikkor lenses were fitted with a open fork to make the aperture data on the aperture ring of a lens readable which is projected via a little mirror in front of the prism into the view finder. Later the forks were reshaped with larger openings to improve readability. Modern AF-lenses are not longer equipped with a fork, although some have little markings on the ridge where forks can be placed if needed. If you need a fork contact your local Nikon dealer or the Nikon Professional Service desk. 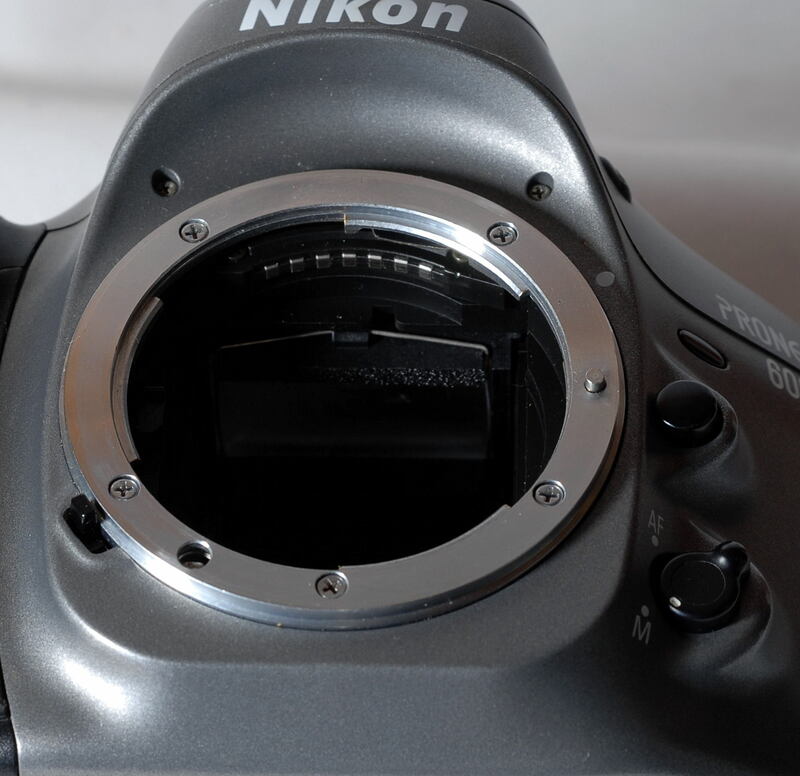 Nikon cameras have a special mount to accommodate a lens. 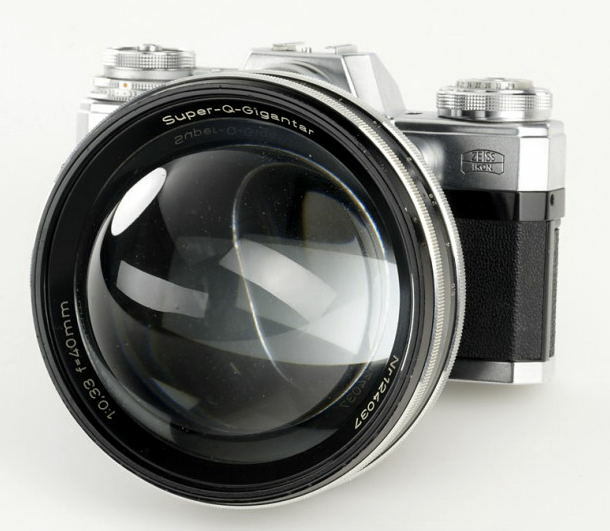 The Nikon rangefinder lenses have the so called S-mount, more or less copied from the early Contax rangefinder cameras. The Nikon SLR´s (for film, sensor or APS) have since they appeared on the market in 1959 the so called F-mount, called after the famous Nikon engineer, the late Mr. Masahiko Fuketa. The Nikonos underwater cameras have their own mount. Via adapters most Nikkor lenses are interchangeable. The Nikonos cameras and lenses - however - are specifically designed and will not fit any other camera. The Nikonos mount is unique! No other lenses will fit. APS cameras have the well-known F-mount and will take all Nikkors with AI and later bayonet (AF); and with some lenses even VR will work. 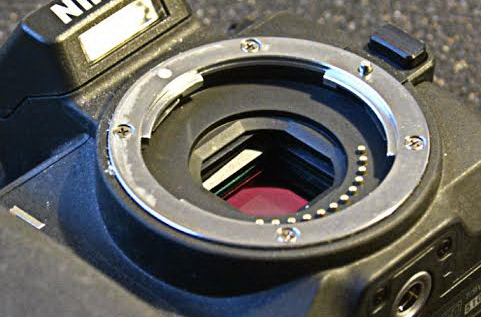 The other way round - IX-Nikkors on F-mount cameras - will give problems due to the rear elements of those lenses. The two APS reflex cameras may take all Nikkors made after 1977 (AI and later). Since Nikon introduced the Nikon-1 series cameras with interchangeable lenses it introduced a new and unique lens mount. Only the CX-lenses will fit all Nikon-1 cameras; they cannot be used on other camera bodies. Via the Nikon FT-1 adapter most Nikkors with F-mount can be used - though with a crop factor of 2.7. 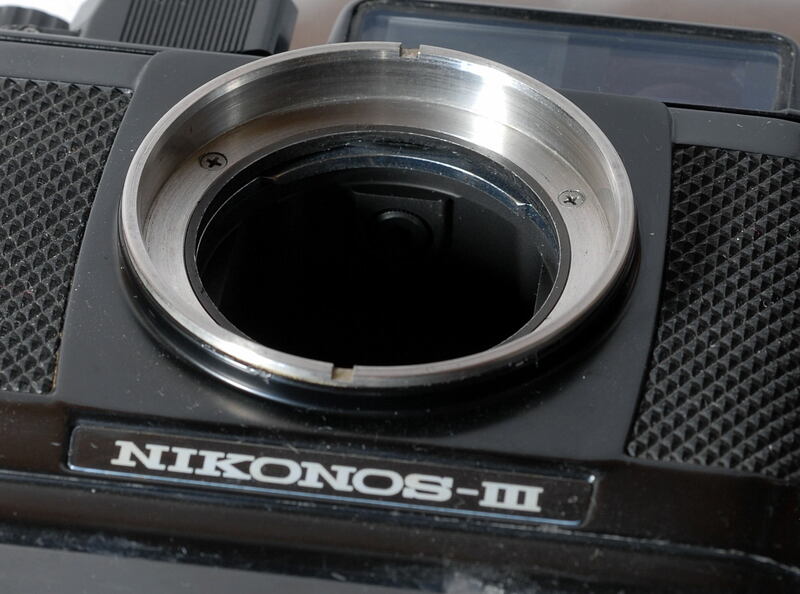 The mount of the Nikon-1 camera series is unique as well. With the introduction of the Nikon-Z cameras in August 2018 a new lens mount was introduced. It enables to use lenses with a larger rear lens and at least 11 electronic contacts. The Z-mount of the new Nikon-Z cameras is a bit wider (55mm) than the F-mount (46 mm). The register is 16 mm. If whatever lens should be placed on a camera the lens mount is important. But there is another element playing an important role: the register (or flange distance) of a camera. The register of a camera is the distance between the lens mount and the film or sensor plane. The back focal distance is the distance from the back of a lens to the film/sensor plane , which is different. Nikon rangefinder cameras have a register of 34.85 mm., all Nikon SLR´s (film, digital and APS) have a register of 46.5 mm. In principle any Nikkor SLR-lens would fit a Nikon rangefinder camera; the other way round is possible as well but the lens can´t be focused at/to infinity. All Nikkor lenses with the S-mount and the F-mount are designed and manufactured to fit both respective cameras. Nikon has produced adapters to fit a SLR-lens on a rangefinder camera and vice versa. There are also adapters to mount a Leica thread (= 39 mm.) lens on a Nikon camera. The Z-mount, introduced in August 2018 has a inner diameter of 55 mm. and a flange focal distance of 16 mm. Using the Nikon FTZ adapter all Nikkors (MF and AF) build after 1977 (AI, AI/S etc.) may fit any Nikon Z-mount camera; only AF-S Nikkors in full mode, all others in manual mode only. Cameras of other brands could make use of Nikkor lenses, as long as their register is shorter than that of the Nikon SLR. Canon SLR´s have a register of 44 mm, Contax SLR´s have 45.5 mm and Leica screw mount cameras have a register of 28.8 mm. In principle these cameras could be fitted with a Nikkor lens. For some of the cameras mentioned special adapters are made (NOT by Nikon!). Certain lens manufacturers, like Sigma, Tokina, Tamron and many others are producing special (permanent or detachable) mounts so their lenses will fit various SLR´s. Older lenses of various brands were fitted with a 42 mm. thread mount. In fact there are two different mounts: the M-42 and the so called T-2 mount. The M-42 has a thread of 42 mm. with a pitch of 1 mm., while the T-2 thread mount has a thread of 42 mm. but a pitch of 0.75 mm. Also their registers are different: M-42 = 45.46 mm., the T-2 = 55 mm. Many movie/film makers made/make use of Nikkor lenses. It is possible to fit a Nikkor lens via a special adapter to a C-mount movie camera, bearing in mind that the register of any C-mount movie camera is 17.526 mm. Here you'll find a matrix of which Nikkor can be mounted on which professional Nikon film SLR camera. And here you'll find a matrix of which Nikkor can be mounted on which non-auto focus amateur Nikon film SLR camera. More matrix's are coming soon! And - finally - see this chapter to find out which Nikkor lens will fit your digital reflex camera. Aperture (from Latin aperture = open) is an indication of the maximum opening of a lens; or in other words: the diameter of a lens. Since 1867 various scientists were trying to define the relative aperture of a lens. Many notations were defined (known as 'apertal ratio', 'intensity ratio', etc.). Since 1961 the notations of the f-numbers are standardized in ASA PH2.12-1961. The f-number or relative aperture expresses the diameter of the entrance pupil in terms of the focal length of a lens. The aperture is marked on a lens in centimeters, millimeters or inches. Older Nikkor lenses have markings in cm., later models in mm. and one (projection) Nikkor is known - Pro-Nikkor 3.5/4 inch - with markings in inches. As stated above the markings or aperture values are related to the focal length and maximum diameter. A lens with a marking f/1:1.4/50mm. indicates that the focal length is 50 mm. and the maximum (relative) aperture is 50 : 1.4 = 35.7, which is or should be the maximum diameter of the opening between the diaphragm blades (not the front lens) of that lens. The aperture on most lenses is marked with letters of an arithmetic series. On older lenses the so called German or ´9´-series (f/1.2 - 1.8 - 2.5 - 3.2 - 4.5 - 6.3 - 9 - 12.5 - 18 - 25 - 36 - 48) is engraved, while modern lenses (like all Nikkors) are engraved with the so called international or ´8´-series (f/0.7 - 1 - 1.4 - 2 - 2.8 - 4 - 5.6 - 8 - 11 - 16 - 22 - 32 - 45 - 64 - 90). The latter series has been chosen as each higher or lower figure indicates a halving respectively a doubling of the amount of light which passes through the lens. Thus a 1.4/50 mm.-lens is two times faster than a 2/50mm.-lens. The maximum aperture of a lens is engraved in the name ring or somewhere on the (tele-)lens body. On nearly all Nikkors the maximum aperture is indicated by number 1, followed by a colon (:) and a aperture or diaphragm value. The on top of this page pictured lens has 1:2 engraved, which indicates the ratio of maximum width of the lens to the focal length. The focal length of early Nikkors is indicated in cm. , later lenses have their focal length in mm. For some people these data may be confusing: sometimes a 50mm/2 lens is presented as a 50mm/1.2. So look carefully to the engravings on a lens. 1:2 is something else than 1:1.2. ´Faster´ is related to a lens with a relatively larger opening so one can choose a higher or faster shutter speed. In the 1950´s and 1960´s a mysterious race between lens manufacturers started. Many of them were trying to dominate the other. In those days a lens with a maximum aperture of f/2.8 was quite normal. But some lens manufacturers presented lenses with maximum apertures of f/1.2 (Leitz), f/1.1 (Zunow & Nikon), f/1.0 (Leitz & Nikon) or even f/0.95 (Canon). Record holder still is Carl Zeiss with its Super Q-Gigantar 0.33/40mm. * Nikon produced a Nikkor-N 1.1/50mm. (a f/1:1/5cm. was never marketed) for its rangefinder cameras, but never came with a faster lens for its SLR´s than the famous Noct-Nikkor 1.2/58mm. Also in tele lenses amazing apertures were offered, like the Kilfitt 1.2/240mm. Most of those lenses were huge, heavy and extremely expensive. 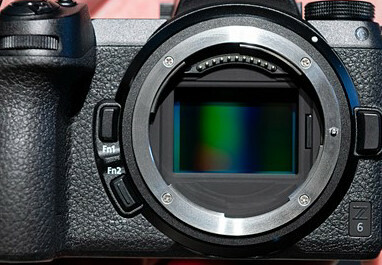 Film margin and sensor sensitivity has increased that far that very fast lenses are of no use. Auto focus sensors in most cameras can easily detect focus when using lenses with apertures up to f/5.6. And - more important - no exposure meter can detect the difference between e.g. f/1.2 and f/1.4. The faster a lens, the more problems a lens designer has to tackle. Due to the refraction of light various aberrations and distortions will occur. Below are a few examples of (pin) cushion aberrations and the depth of field (DOF) of very fast lenses. The DOF of a lens like the Noct-Nikkor mentioned before at the closest distance is just a few millimeters. For some compositions interesting but in most cases leading to non-sharp images. *Shown on the stand of Carl Zeiss at the Photokina 1966. This one-off production in Contarex mount was a PR try-out. A more serious but also one-off production was the Zeiss 0.7/50 mm. lens, originally developed as a still-camera lens for use by NASA in the Apollo Moon-landing program, and modified by Cinema Products Corp. at the request of Stanley Kubrick specially for filming "Barry Lyndon". The Zeiss 0.7/50mm. lens, with the Kollmorgen adaptor, was mounted on the non-reflex Mitchell BNC camera utilized to shoot the film's candlelight sequence. As shown above 'De Oude Delft' (optical lens manufacturers) in Holland produced the Rayxar 0.75/50 mm. for X-ray photography. The lens has no aperture blades, so has to be used full open resulting in images with a lot of field curvature and no DOF. Most lenses, used for photography or other purposes, have an engraving indicating the focal length of that particular lens. Older Nikkors have their focal length in centimeters, in 1964 Nikon changed that indication into millimeters. To give a definition of the focal length of a photographic lens isn't easy. Have a look here for an explanation. The focal length of a lens is measured at the lens axis when the lens is focused at infinity. If a lens is focused at a closer distance the focal length and maximum aperture may vary. Each lens has to collect light (or image) and 'project' that onto the film or sensor plane. It is clear that any lens should have an image projection with a diameter which will correspond with the diameter of the film or sensor plane. 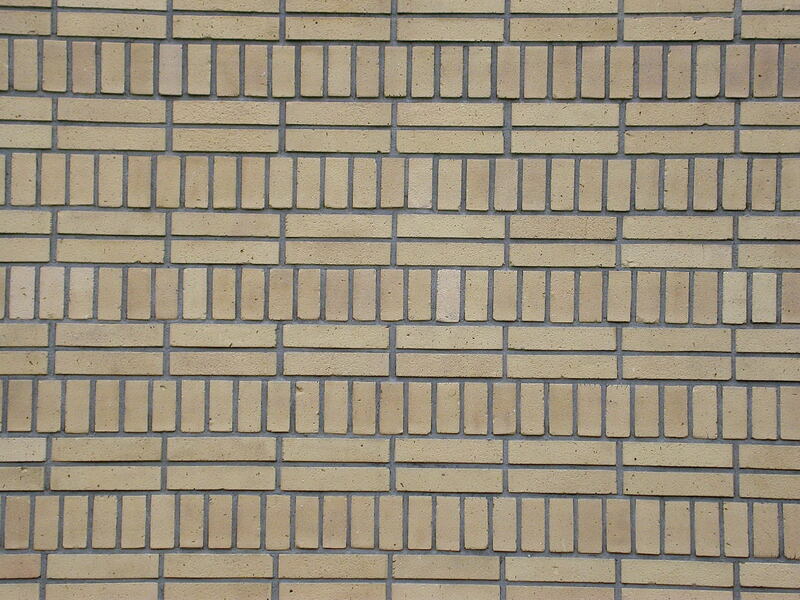 A 36x24 mm. film or sensor plane has a diameter of 43.3 mm. This round projection area is called the Ramsden** disc in older literature on optics. The early Nikkor lenses on the Nikon I, Nikon M and Nikon S cameras were manufactured for the use on cameras with a 36x24 mm. film size, but these cameras had a smaller image size, thus have a crop factor of 1.0825. (32x24 mm. has a diameter of 40 mm.). A coincidence of this is that the Nikkor lenses used on these cameras had/have no vignetting at all and the effective focal length is a bit longer than indicated (50 mm. x 1.0825 = 54.1 mm.). The APS-format film and sensor plane of modern film and digital cameras have different sizes. The classic APS-format is 25.1 x 16.7 mm. having a diameter of 30.15 mm., which leads to a crop factor (compare to 36x24 mm. format) of 1.4. The sensor of the Nikon D1-series (and many other digi-SLR's) has a sensor format of 23.7 x 15.6 mm, having a diameter of 28.4 mm leading to a crop factor of 1.525. This means that when a 'normal' Nikkor for 35mm. photography is used on an APS-SLR camera the effective focal length should be multiplied by 1.4. Thus a Nikkor 1.4/50mm. will become a Nikkor 1.4/70 mm. That same Nikkor will become a 1.4/76 mm. on a Nikon D1 etc. It may be clear that lenses designed for the use on cameras with a smaller film (APS) or sensor (DX) format, will have a shorter effective focal length. ** Ramsden disc aka exit pupil defined by Jesse Ramsden (1735-1800), an English astronomical instrument maker. The Depth of Field (DOF) depends on the aperture used during exposure. The smaller the aperture (or the higher the aperture number) the larger the DOF will be. A fast lens used at its maximum aperture (= full open) will result in a small DOF, while used at a smaller aperture the DOF will increase. It is up to the photographer's composition of an image whether a small or large DOF is wanted/needed. Lenses with the same focal length but with a different maximum aperture will have the same DOF at the various apertures: so a 1.4/50 mm. lens will have the same DOF at f/5.6 as a 2/50 mm. lens. at f/5.6.